Whisky Tumblers Capacity : 10 OZ. ☀This set of four uniquely designed whisky glasses stands as the best investment to decorate your home bar and will exceed the expectations of every liquor connoisseur. ☀ Enhance the sensory experience of drinking scotch, rye, bourbon or any cocktail by drinking your favorite spirit in a heavy whiskey glass that is both aesthetic and pleasant to hold. ☀Perfect gift for whisky lovers, mixology enthusiasts, groomsman, newly weds, housewarming or host gift. 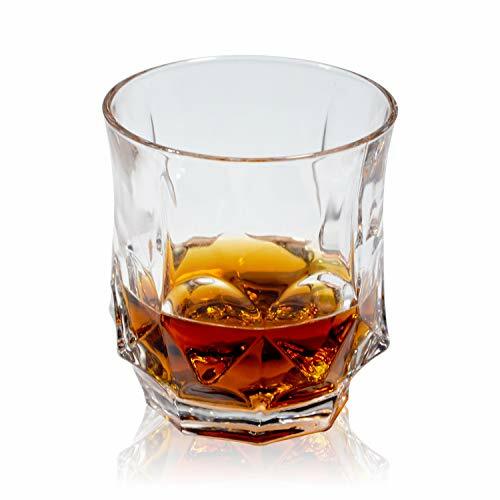 ☀Proudly host friends and family gatherings with this magnificent lead-free whiskey glass. It is a great conversation starter and will be the envy of all your guests. Our products are backed with a 100% perfect delivery guarantee. If the glasses are damaged in any way upon arrival, we will send you a replacement for free.